For a number of years only two names really stood out as the mainstream kings of the horror genre – Stephen King and James Herbert. Despite the fact that both men are now well into their sixties, they're still going strong. Recently King returned with his novel 11.22.63 and now Herbert is back with this, his 23rd novel, and his first novel in six years. Up in a secluded spot in the highlands, lies an impressive castle: Comraich. It's like the world's most expensive hotel, but the difference being that once a guest checks in, they never leave. Now that's exclusivity for you. Recently there have been a number of unknown disturbances at the castle, caused possibly by paranormal activity. Keen not to upset their guests further, the castle's wealthy keepers decide to call on the expertise of Ash, a paranormal detective. Ash knows his stuff when it comes to ghosts and ghouls, but it doesn't mean it hasn't taken its toll on him; despite what he tells his boss and others, he may not be as independent from alcohol as he makes out. As soon as he arrives at Comraich, he knows immediately that something isn't quite right. And it's more than just the supernatural at work here. He didn't quite understand why he had to sign so many papers regarding the security and privacy of the so-called guests, but it all becomes very clear. Comraich was home to not only a spiritual dark side, but also a number of infamous characters the world thought didn't still exist. Ash believes that the castle's recent supernatural woes must certainly be connected to the presence of certain guests, who are clearly helping to create a disturbingly dark force around them all. The question remains, can Ash deal with it? 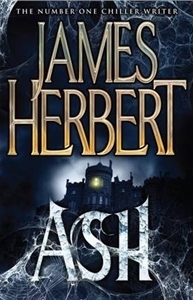 Anyone familiar with Herbert's recent work will know that this is the third outing for his ghostbusting detective, as David Ash also featured in Haunted and The Ghosts of Sleath. The character himself is actually amiable enough, but Herbert disappoints much of the time with character development and plot. The biggest crime is a relationship Ash develops with a doctor at the castle in the time it takes to prepare a Pot Noodle. Considering that the pair are both far from being adolescent, there's something worrying about how quickly they declare their love for one another; it's the stuff of Mills & Boon nonsense and not what you would expect from someone of Herbert's pedigree. It's a shame that their relationship features so heavily, as the rest of the story is pretty interesting; one of the biggest characters in the book is the castle itself, which makes the perfect haunted house. Then there's the story of the guests themselves; a band of well-known characters who've achieved a fair amount of notoriety for their actions. The problem is, all these factors detract from the supernatural element of the book, which Herbert appears to ignore for the most part. Which is a shame as it's been his ghoulish bread and butter for so many years; so if your expect a fright from this book, the only one you'll get is when you realise how many pages you will need to get through until the end. For some reason, Herbert also seems keen on often referring directly and indirectly to the furry protagonists of his first novel Rats; it's quite charming the first time, but soon becomes a bit of a chore with repetition. If like us, you had never read a James Herbert book before, this book would have to be deemed a major disappointment. For someone well known for spine-chilling prose, this one is more likely to leave you comatose.